Heroes will find themselves aided in their adventures by the mysterious and powerful Jok, who stand behind their chosen champions. Prepare to battle for the soul of Ifri, from glittering deserts, stunning jungles, and the vast open sea. 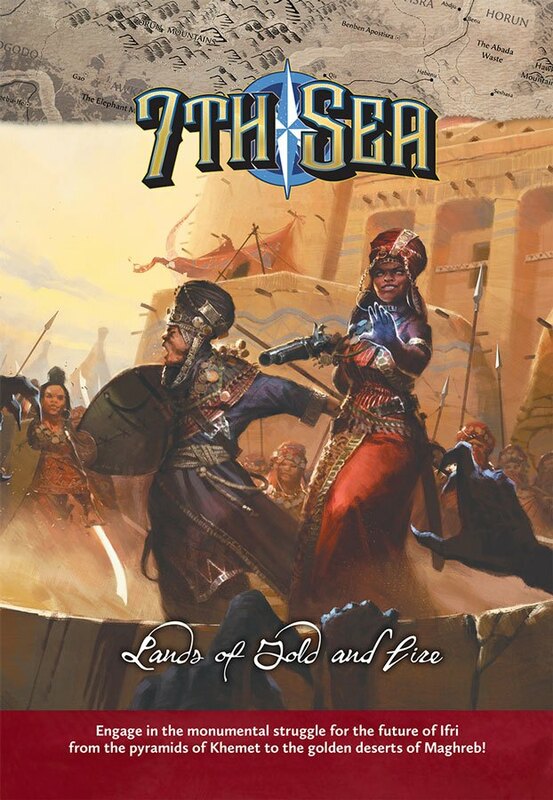 This book contains material for 7th Sea: Lands of Gold and Fire including new mechanics for Backgrounds, Advantages, Arcana, Stories, Dueling styles, and Sorceries. Manden, a land overflowing with gold, with a keen eye for international diplomacy. Mbey, a once great nation now controlled by an ancient evil which threatens all of Terra. Maghreb, whose beloved Blue Queen reigns over a desert land with a fierce soul. Aksum, where logic combines with sorcery to create a strategic and effective empire. Khemet, where darkness shrouds an ancient empire and a Prince seeks to bring the light. A shadow has cast its shape across the glorious lands of Gold and Fire, will you join the fight to dispel it?